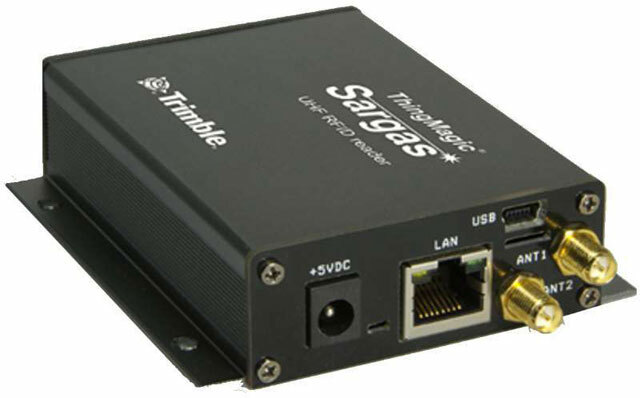 The ThingMagic Sargas reader is a high-performance, 2-antenna-port, networked, UHF reader in a low profile enclosure. Built around the ThingMagic Micro reader module, the device reads more than 750 tags per second at distances over 9 meters (30 feet) when configured with appropriate antennas. With an onboard processor, memory and removable flash storage, the reader has features designed for enterprise applications, and easy system integration. 2-Port UHF Fixed RFID Reader, FCC (902-928 MHz) - For countries adhering to US standards. Non-returnable/Non-cancelable. RAINstream license for one Sargas. Non-returnable/Non-cancelable. AEI ATA protocol license for one Sargas Reader. Non-returnable/Non-cancelable. IPX and ISO 18K-6B protocol license for one Sargas Reader. Non-returnable/Non-cancelable. Sargas Development Kit (does not include the reader). Non-returnable/Non-cancelable. Sargas Multi-Region Power Adapter (indoor use). Non-returnable/Non-cancelable.